This infrared photography tutorial will guide you to your personal IR solution. It will identify and explain your most important choices. You are interested in infrared (IR) photography in general, but you would like to understand the topic better before you get started? Maybe you are already considering infrared photography, but you don’t know what to expect? Do you feel simply overwhelmed by some of the technical details or concepts? If the answer to any of these questions is yes, this infrared photography tutorial might be exactly what you were looking for. Why do we need an(other) infrared photography tutorial? To address this, I wanted to create a structured introduction to the world of digital infrared photography. It should not be too technical and it should make the reader aware of choices and limitations. At the same time, it should provide useful guidelines for decision making. Now that we have clarified the purpose, let’s jump right in! What is digital infrared photography? The first thing we will cover in this infrared photography tutorial is: “What is this all about?”. In a nutshell, infrared photography is about recording images using a spectrum of light beyond what we can see with our naked eyes. What makes infrared pictures so attractive to many of us? Most would say it is the unreal look of bright white foliage – as if covered with snow, combined with a dark sky and ethereal glow around contrasty edges. Often, infrared pictures are also presented in black and white, with strong contrasts. Imagine a rainbow. The visible light spectrum consists of wavelengths from ca. 400 nm (violet) to 700 nm (red). Infrared photography uses wavelengths from ca. 700 nm to 1.400 nm (near-infrared light). At the opposite end of the spectrum, ultraviolet photography uses wavelengths from ca. 300 nm to 400 nm. You can find more technical background in this Wikipedia article. One of the nice things about infrared photography is that it works best in strong, direct sunlight. This is usually when all the other photographers complain about “bad” or “too harsh” light. 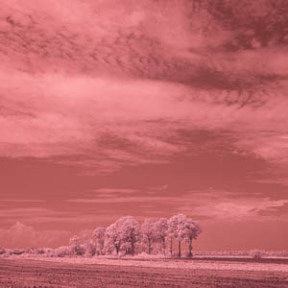 The most cost-efficient way to try out if digital infrared photography is something you like or not, is to buy an infrared filter. When you screw the filter on your lens and look through your viewfinder / at your rear display, you will see… pretty much nothing. Since the visible part of the light is blocked out, only a fraction of the light that would normally reach the sensor passes through the filter. In this regard, using an IR filter is like using a very strong neutral density (ND) filter. As a consequence, you need to either increase the exposure length, open up the aperture and/or increase the ISO value. When using an IR filter, you will need a tripod and be able to shoot only static subjects. This modification will make your camera much more sensitive to infrared light, compared to using an IR filter. After the conversion, usually you can take handheld pictures the same way as with an unmodified camera. In technical terms, the low pass filter in front of your sensor is replaced with a different piece of glass. This lets infrared light pass but also cuts out at least part of the visible light spectrum. You have an older digital camera sitting in the corner collecting dust? You may want to convert it into your brand-new digital infrared camera. Low resolution is usually not an issue, and noise at higher ISO values will actually add to the mood of your pictures. Once you have decided to have your camera converted, your next question will likely be: Where can I have my camera converted? You can read the answer in my article Infrared Camera Conversion Service: The Complete Provider Overview. This is probably the toughest decision you need to make in this digital infrared photography tutorial. Think about the following question: What attracts you when you look at IR pictures? Is it the false colors? The white foliage with a blue sky? Or do you prefer black and white IR? Because with one exception, you cannot have it all at the same time. In the “good old days” of film photography, your choices were very much limited by the type of IR film available. 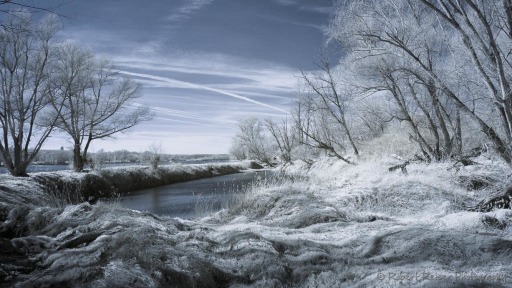 With digital infrared photography, you have many more options available to you, especially when you convert a camera. The following table lists your choices. Since all the IR filter makers and camera conversion companies use different terminology, I tried to use common terms as much as possible. For excellent visual examples of the various filter types, the comparison pages provided by Life Pixel and Kolari Vision. With this filter type, you are basically restricted to pure black and white conversions. The raw data does not contain any color information. So, if you are after black and white images anyway, this filter type will make you happy with the darkest skies and the brightest foliage. If you are unsure about which filter to choose, take this one. It is a good compromise between false color and black and white. You can achieve the infrared blue sky effect, and you can achieve nice black and white conversions. This is the filter I used in most of my converted cameras. Similar results as with a standard IR filter, but with more color information in the raw data. Out of the camera, the picture has less contrast compared to a standard IR filter. 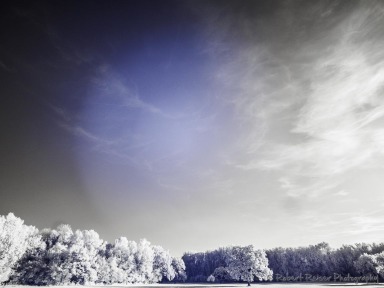 This filter is your best choice if you like pictures with the IR blue sky effect. This filter will retain the highest amount of color information in the raw data. This filter is your best choice if you like false color IR photography. This is your choice if you don’t want to limit your options. The filter lets the entire light spectrum pass, from Ultraviolet to Infrared. You can then select the desired spectrum by placing a filter on your lens. This approach is a combination of using infrared filters and camera conversion. While this is the most flexible option, it is also less convenient. You will need to carry multiple filters or at least step-up rings for all your lenses. Some companies offer what they call a “Super/Ultra Blue” filter. It is a Standard IR filter which also allows some blue light to pass through to the sensor. The only purpose of such a filter is to get the “Infrared Blue Sky” effect straight out of the camera. If this is what gets you exited and all you ever plan to take pictures of, this is your choice. I would rather choose one of the other infrared filter types, as they provide a lot more flexibility. The Infrared Blue Sky effect is actually easy to create, as you can see at top of this page. I have described the process in my article How to Create the Infrared Blue Sky Effect in Lightroom. You still cannot make a decision because there are two ore more conversion choices you find really attractive? For example, you like the idea of creating nice IR blue sky effects using a 665 nm filter? But sometimes you would also like to create impressive black and white pictures using a 820 nm filter? And you don’t like the Full Spectrum idea of having to use a filter on your lens all the time? I may have a solution for you: Go for the filter with the lower cutoff frequency. In the example above this is the 665 nm filter. You can now take infrared pictures using any lens you like. And if you would like to take Deep B&W pictures, buy an 830 nm filter for your favorite lens. With it you can take those impressive black and white pictures anytime you want. It is like having the best of both worlds! Depending on your infrared filter choice, the automatic white balance feature of your camera may no longer work as expected. So on your camera display, the pictures will show up with a strong red cast. For “Deep” and “Standard” IR filters, you can reduce the strong red cast by taking a custom white balance reading off an area of green grass or green foliage. For “Enhanced” and “Super” IR filters, you can try setting white balance using a standard grey card. Disclaimer: LifePixel provided this helpful information. To work around the reddish pictures on your camera display, set your camera to take RAW (instead of JPEG) pictures. Then enable the “black and white” mode in your camera. Now you see a nice black and white version of your image on your display, but your RAW file still contains all the color information. You can reduce the red cast somehow by setting the right white balance in camera. But usually what you will see right after the import is similar to the example above. This is true even if you did follow the the instructions above and the pictures on the back of your camera did not look bad at all. This issue is caused by limitations in the software. I wrote an article about how to fix this and set the proper white balance in Lightroom. If you use different software to edit your pictures, this issue probably does not affect you. A hot spot usually shows up more prominent if the camera is pointed towards a strong light source, like the sun. A hot spot may also only be visible at certain aperture settings. The only reliable way to find out if a lens will produce a hot spot, is to test it. A good idea would be to rent a lens for a weekend, before you buy it for your infrared camera. Having said that, the Internet is full of reports about the IR suitability of specific lenses. The best collection I have found so far is the Lens Hotspot Database by Kolari Vision. Other resources are IR and Lenses by DPanswers and the IR Photography Intro on Ultraviolet Photography. Or you can google your lens name plus ‘infrared’. 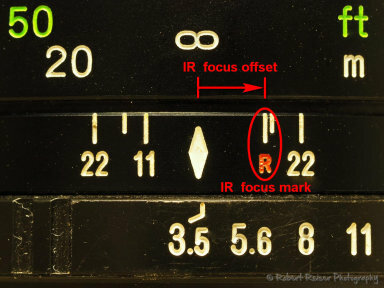 This is the infrared focus mark. It indicates how far you need to rotate the focus ring to achieve correct focus in infrared light. With an infrared filter in front of your lens, this is your only choice to get the correct focus. First, you focus using visible light. Then you screw the infrared filter on the front of your lens and turn the focus ring according to the infrared focus offset. Reality is that most of the newer lenses do not have this mark anymore. Without this mark and using an infrared filter, you can only guess the correct focus distance. You can use a small aperture to increase the depth of field. Or you can take a series of pictures with slightly different focus distance settings and check for correct focus on the camera display. DSLR cameras typically use phase detection autofocus systems. They are very fast, but their accuracy depends on the wavelength of the light. That means, during the conversion, the DSLR needs to be calibrated to a specific lens. This is because each lens has a different infrared focus shift. Or you can have your DSLR calibrated to visible light and use the infrared focus marks on your lens for correction. In “Live View” mode, your DSLR will use contrast detection autofocus. This is also the autofocus system used by most mirrorless cameras on the market. This autofocus system is generally slower, but more precise. Its biggest advantage is that it works independent from the wavelength of the light. As such, it does not need any form of calibration if you want to use the camera for infrared photography. If you would like to read more about the various autofocus systems, Wikipedia has a good article about autofocus. In summary, mirrorless cameras have an advantage over DSLRs when you convert them to infrared. There is no need to calibrate them to a specific lens. Their contrast-detection autofocus system works as good in infrared light as in visible light. With a DSLR, make sure to use the “Live View” feature for precise infrared focus. With that, I wish you good light and a lot of success with your infrared pictures! If you have any questions about this digital infrared photography tutorial, please leave a comment below and I will be happy to reply. Trying to find an infrared camera conversion service provider? Check out this global list of businesses and learn about helpful details. A step-by-step guide on how to create the infrared blue sky effect in Lightroom, using only free tools. No Photoshop channel mixer required. A step-by-step guide on how to work with infrared pictures in Lightroom. Learn how to create a custom profile for proper infrared white balance. thanks again for your time and your advises . my name is Anastasio,i have taken the infrared and uv sensor filter out from my nikon d70 .I want to ask you if i can add a filter to the lens? 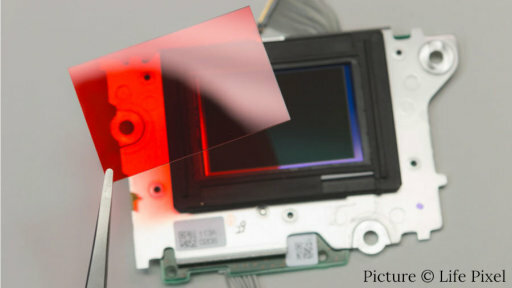 instead of adding a filter to the sensor and how efficient this would be, in matter of exposure time is this important ,meaning faster or slower and how; and also in matter of focus? Hello Anastasio, did you remove the filter yourself? Was the filter just taken out or replaced with optical glass for example? You can add a filter to the lens, for sure. Exposure times will always be slower when compared to visible light, since the sensor is not designed for Infrared light. It depends on the IR filter you plan to use. On focus, this article does explain it here and here. Hello Robert ,thank you for your answer. Yes i remove the filter myself and i didnt add anything in front of the sensor .So the question was,what is the best to do ,add the IR filter to the lens or to the sensor? or is it the same?thanks in advance. My understanding is that the filter in front of the sensor is part of the optical system – removing it it may or may not work, depending on your camera. You will have to try if putting an IR filter in front of the lens leads so satisfactory results. I have just converted my olympus em5 to full spectrum, i am familiar with using infrared but there doesnt seem to be any clear or concise tips etc for full spectrum. I. E can i use full spectrum at night with no filters? What can i expect results wise? Do i need a special filter for astrophotography /landscapes. Hello Liam, thanks for the question! To be honest, I was so far using Full Spectrum cameras only in the context of Infrared photography, meaning I waas using either an Infrared or a Visible Light filter on the lens. You can definitely use the camera without additional filter, but I would expect the result to be reddish, because of the high amount of Infrared light which is normally cut out. For astrophotography, you might want to look at H-Alpha filters, but there are other people out there who know a lot more about Astrophotography than I do. Good luck! Thanks for your tutorial. I like it very mutch. Let me ask this: I have a ff modified camera for astrophotography so I dont use filters. But I take photos with a SMC Pentax A 28mm 2.8 lens. The photos have very nice colors, Thiesen colors are what you call “false colors”? Thank you. Hello Antonio – if your camera has been modified for astrophotography, your pictures will for sure look different when compared to “standard” pictures. In this regard, you can say that what you get are “false colors”. The colors are just different from what you would get with an 650nm Enhanced IR filter, for example. But there is no definition of “false colors” – it is just a description of anything different from what you can see with your bare eyes. Another thing, I bought a Hoya 72R filter, I presume that converts my FS camera to infrared one. That is correct? Should I do swap the colors? Provided the sensor works well with the Hoya filter, you will certainly be able to take nice IR pictures. Whether you prefer to swap colors or not, is totally up to you 🙂 What might help are these two articles: How to Set Proper Infrared White Balance in Lightroom and How to Create the Infrared Blue Sky Effect in Lightroom. Good luck and enjoy the results! I have recently gotten my camera converted by lifepixel. I chose the Super Blue option not the Full Spectrum. Can I use a filter on the front of the camera to change colours even more? Say for instance the 590 filter? Hi Justin, thanks for the great question! According to Lifepixel, their Super Blue Filter appears to be a 705nm filter with additional blue light sensitivity between 285nm and 465nm. So, you will be able to use any IR filter in front of your camera with a pass frequency of 720nm or higher, for example a 830nm filter for deep BW IR. Unfortunately the 590nm filter you mentioned won’t work as you would expect, effectively it would give you the same result as an 705nm filter. Great article. Informative and unpretentious! Thanks so much for taking the time to write it. Thanks a lot Rob for the feedback, I really appreciate it. You can try a different filter. The B&W 093 is a deep black IR filter with a cutoff frequency of 900nm – you may want to try a different filter with a cutoff frequency of 720nm or even lower, which may reduce the hot spot. In general, you should always always try out the lens/filter combination before you buy it. Good luck!